Below you will find some goodies! We have the link below for the downloadable PDF with your materials list for the two different colorways that Pat has created for this quilt. We have the video she recorded to introduce you to the Mystery BOM, as well as the fabrics she selected in her materials list. We also have the link to the Flickr group we have created for this project where you can upload images! Let's go... it's Vacation Time! 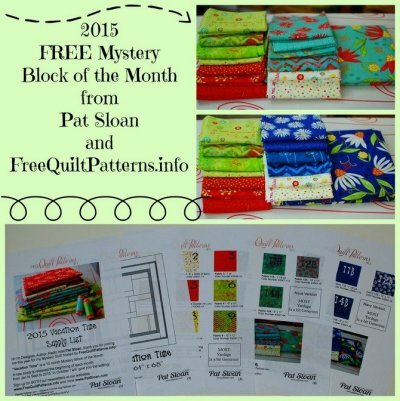 This year I'm delighted to again work with FreeQuiltPatterns.info to design and host a fun FREE Mystery Block of the Month (BOM) called “Vacation Time”! My name is Pat Sloan. 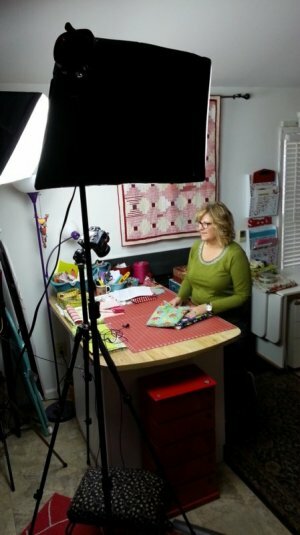 I'm a Designer, Author, Teacher, Story Teller, Radio show host and passionate quilter. The quilt is 9 sections and finishes to 64" x 68". A new section/Block will be posted here around the first of the month, starting on Jan 2, 2015 to October 2015. Then you have a chance to finish up in November and have it quilted by the end of the year! Each section, which is usually one block, will celebrate something I like to do on Vacation! We will be keeping this very playful and fun. Please watch my video about the fabrics I'm using for our Mystery Block of the Month. A little 'behind the scenes' with me! Here I am testing out the lighting and camera spots for filming the videos. I will be showing you two versions of the quilt made with my “One for You, One for Me” by Moda. List of Pat Sloan Mystery BOM Participating Shops Coming Soon! 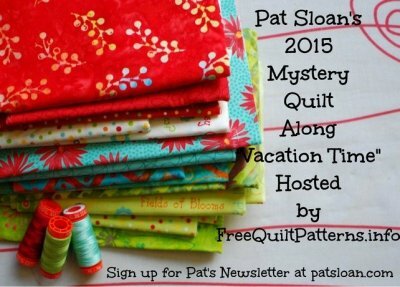 Click Here to download the PDF of Pat's materials list for her Vacation Time Mystery Quilt! NOTE: If the document doesn't display properly for you, there may be a problem with your browser's PDF viewer. From the viewer window, there is a download button that will let you save the PDF to your computer, where you will be able to view and print it just fine. I highly recommend that with dark/light quilts you prewash your fabric. I don't want any tears later when you wash that quilt and it runs blue onto white ..eep! The step of prewashing can be done quickly and then you are ready to rock and roll the first week in January when the first block is published. Are you ready to sew with me in 2015?? leave me a comment below, tell me what you do on vacation! !